Sometimes you simply need a man with a van Bristol, no hassle no stress. Maybe you need a sofa moving pronto, a last minute eBay collection or a friend has let you down. Maybe you’re a business that has been let down by your regular delivery services and need your product safely and securely delivered to your eager and awaiting customers. Either way, you really don’t want to let your customers down and you really don’t want to lose your chance to bag that perfect sofa you have always dreamed of. Stress levels are high and your scrambling and searching desperately through the internet looking for a Bristol man with a van service that can come to your rescue. You need someone reliable, affordable and professional on demand for short notice calls. You’re trying various numbers scattered over shabby looking websites and no one is answering. Half the time you don’t even have the option to leave a message but if you do no one is getting back to you. The people you get through to are charging extortionate rates for short notice calls. They don’t seem to have the time to discuss your move in any detail, they have a sofa in one hand, a fridge in the other and a headpiece phone set that is muffled and distorted so half the time you cant even hear them properly. The truth is most man with a van Bristol services are stretched and over worked with little support or time to manage logistics and give their customers the time and attention they need to ensure things run smoothly and in good time. Imagine a Bristol man with a van service that has been running for years and has building the internal structures and support within itself to deliver a professional, affordable and friendly service. Imagine a service that is contactable so when you call you speak to to an experience member of staff that takes all the details they need and provides you with a fair an accurate quote. He/She is not navigating the chaotic roads of Bristol or a carrying half a house up a narrow stair case. This person is in a quiet calm office and has the time to discuss all the logistics of your move in the detail needed to ensure everything runs smoothly with no hitches or complications. Imagine a Man with a van Bristol service that arrives with on the dot timing to each of their moves because they take the time to plan ahead and schedule there work. Imagine a service which in the rare instances that they are running late they call you and let you know. Imagine a service that turns up with a smile and has the time to handle your belongings with due care and attention because they are not rushing at a million miles an hr because they are running late for their next job. 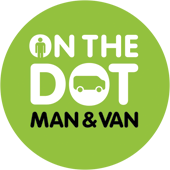 Well you don’t need to imagine this service because On the Dots man with a van Bristol service delivers it as a reality day in day out. Call us now to discuss your move.